The Good Book Company is passionate about equipping individuals and churches to follow Jesus. If you would like to come onboard and join our 30-strong staff team in North Surrey, then please browse the vacancies below. Occasionally, we employ temporary staff in our picking and packing department and freelance designers and illustrators in our creative department. If you are interested in these opportunities, please send us your CV and a covering letter outlining a little about yourself and any relevant experience. 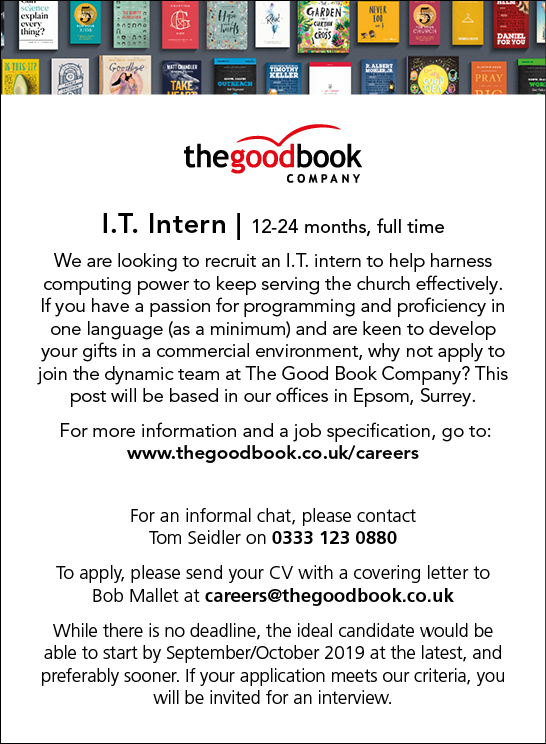 Unless specified CVs can be sent to careers@thegoodbook.co.uk. We will keep any suitable CVs on file until appropriate vacancies arise. Download a full job specification.